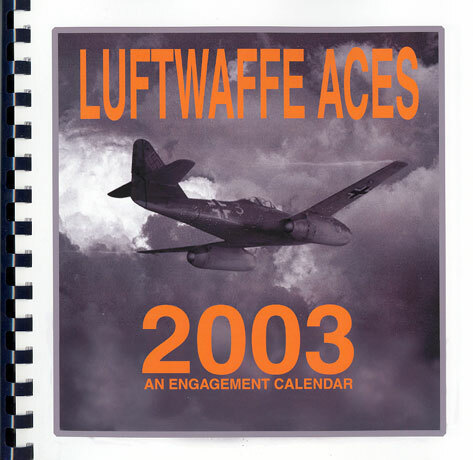 Description and Publisher’s Details: "Luftwaffe Aces – An Engagement Calendar 2003"; self-published by Virgil O’Neil, email virg@wtp.net . Media: Soft cover, 21.5cm x 21.5cm, 94 pages plus covers (12 pages plus rear covers blank). Disadvantages: Might get the occasional strange look from colleagues if using this as your work desk calendar. Virgil O’Neil follows up his original idea last year with a brand new Luftwaffe Aces Engagement Calendar for 2003. This Calendar follows the same format as last year with a soft cover, bound by plastic spiral ring-binder, in a square format approximately 21.5cm x 21.5cm. There are 94 pages (of which 12 are blank) plus covers. The calendar commences with a one-page introduction to several key facts about German fighter units, ranks and awards. 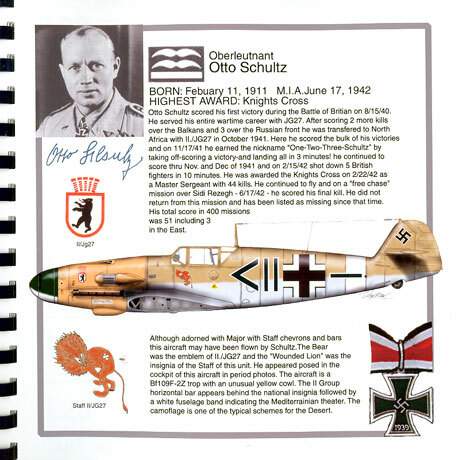 This comprises a brief explanation of Luftwaffe rank equivalents in the RAF and USAAF, a synopsis of the R-3 Field Conversion Kit, a description of the various levels of the Knight’s Cross and a single paragraph to explain Luftwaffe Fighter Unit designations and identification schemes. This introduction is followed by the main calendar. There is one week to each engagement page. These pages are punctuated with milestones for the Aces in the book (eg appointments to command, important victories etc), in addition to random references to major military anniversaries and, of course, US public holidays and other relevant planning information. 12 of these engagement sheets feature full-page "watermark" photographs as a background. However, the real highlight of this Calendar is the colour artwork. There are twelve colour pages. Each contains one colour aircraft profile, a photo and facsimile signature of the pilot, a brief history of the ace, and additional artwork of any personal and unit emblems plus awards and highest rank. This full-colour page is printed on Epson photo paper. The profiles include a Bf 109D, Bf 109F-2, Bf 109F-4, Bf 109G-6, Fw 190A-4, Bf 109G-6/AS, Bf 109F-2/Z Trop, Fw 190A-6Me 262A-1a and finishes off with two Bf 109E-4s. Each is very nicely depicted. The printing process does justice to the attractive profiles. One quirky attribute of the profiles of the Fw 190s and Bf 109s is that the wing has been "removed" – we see inside the wing root to the interior of the aircraft! Interesting approach. The facing sheet of each profile features a full-page composite image of the Ace’s aircraft in action. These images are a blending of model aircraft with electronically generated backgrounds, created in Adobe Photoshop. The resulting image has been reproduced in grainy black and white to add an air of authenticity. There are few typos here and there, but this aspect is generally improved compared to the premiere offering. Non-Commonwealth readers should note, though, that Boxing Day is on December 26, not December 25 as stated in the Calendar! This desk calendar is an interesting concept. It is also very well executed. The artwork is attractive and the succinct package of information about each Ace is interesting. I have been using the 2002 Calendar here at the HyperScale office (my basement) over the course of the year, and will undoubtedly be doing the same with this new edition. The "Luftwaffe Aces Engagement Calendar" will be a good companion on the modelling bench or an appropriate gift for a Luftwaffe modelling fan. It will cost you more than your common Garfield calendar, but it is certainly much more individual too! The price is very likely attributable to what appears to be a short-run, labour intensive production process. Thanks to Eagle Editions for the review sample.